On Oct. 23, Apple held a media event in San Jose, CA. After introducing new entries into the MacBook, Mac Mini, iMac and traditional iPad lines, they had a big announcement to make: the iPad Mini would be unleashed less than two weeks later, on Nov. 2. Said to be smaller, sleeker and “Every inch an iPad” as the slogan claims, the white version of the device has already completely sold out on preorders alone. As this new gadget is poised to explode out of the starting gate, it is time to take a closer look and discover if the iPad Mini really is the next great advancement for Apple or just another disappointing release. To begin, let’s analyze the most obvious change—the new size. 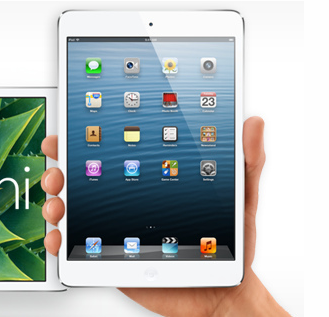 The iPad Mini features a 7.9-inch display, as compared to the 9.7-inch display of the new Retina iPad. However, it is also slimmer (by 23 percent) and much lighter (by 53 percent). This makes it easy to handle the device with one hand, and is actually an important improvement compared to how unwieldy the full-sized iPad can be at times. And with 7.9 inches still available for screen space, it doesn’t appear that there will be any problem with the amount of real estate that consumers will have to work with. One way in which the iPad Mini falls short of the third and fourth iPads, though, is in its lack of Retina. The screen will have a roughly identical resolution as the iPad 2, with the same 1024×768 display but a slightly better amount of pixels-per-inch, with 163 as compared to the iPad 2’s 132. While this resolution will still look crisper and clearer due to its smaller screen size, it’s a bit of a disappointment that Apple’s prized new display technology hasn’t found its way into its newest innovation. At least there won’t be any problem with not being able to run the same apps as a full-sized iPad due to screen limitations; all software designed for the iPad is immediately compatible with the iPad Mini. Looking at the technical specifications of the iPad Mini, it is mainly up to date with the best Apple has to offer, but with some important exceptions. It features the same 5-megapixel cameras as the third and fourth generation iPad, as well as 720p/1080p video (from the front and rear facing cameras, respectively), improved Wi-Fi speeds with LTE connectivity and a 10-hour battery life. It will also house all of the newest software, with iOS 6 and Siri. However, the iPad Mini features an A5 performance chip, which is not one, but two installments behind the newest chip, the A6X, found in the newest full-sized iPad. In addition, the iPad Mini has some annoying design decisions, such as the lack of SIM card support and the new Lighting port, which renders all previous peripherals and accessories useless. Fret not though, because there is an adapter available for the old port—sold separately, of course. After taking a look at what the new iPad Mini has to offer, the burning question remains: should I buy it? At the end of the day, the iPad Mini is mostly up to date, save for a few discouraging omissions. Its smaller size is a big plus and full compatibility with existing software is important, but there is no “wow” factor that would really aid a product like this, especially with its $329 price tag. Current iPad owners don’t really have any need for this device, but if you’re looking to pick up your first one, this is not a bad way to start at all. Looking at the iPad Mini versus the new fourth generation iPad, which is released the same day, it all comes down to the size. If increased mobility is your thing, the iPad Mini might be the product for you. However, someone looking for the most up to date iPad experience would be better off with the full-sized device.